We love hearing from you, so please do get in touch. Or if you're simply looking for directions, walk this way! Our cellar door is 45 minutes from Mudgee; 1 hour from Bathurst; 1.5 hours from Leura/Katoomba and 3 hours from Sydney, offering you the perfect opportunity to nip over and visit us during your stay in the region. We have attached a Google Maps pin for you to use to get you from your door to ours! 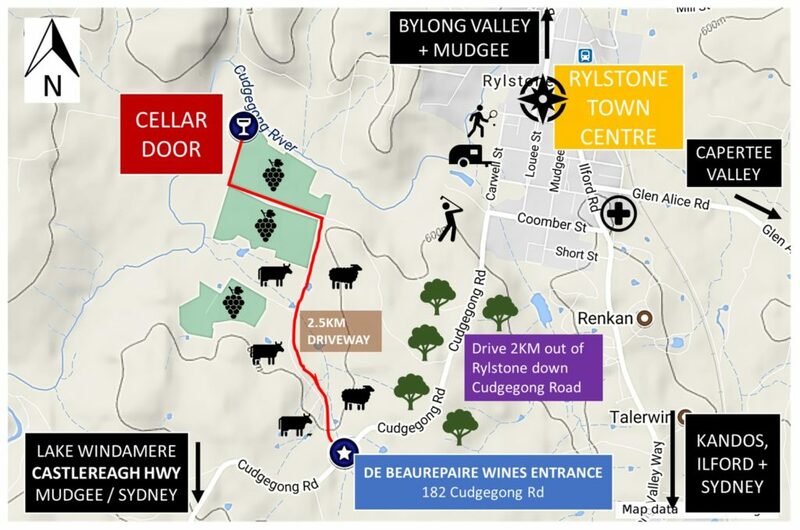 Unfortunately, Apple Maps will send you to the wrong side of the river from Rylstone, so unless you’d like to swim across, please use the mudmap of our immediate area to help you navigate to our cellar door. Please watch out for sheep, cattle, kangaroos, members of our vineyard team, and vineyard machinery as you enjoy the beautiful views!